The first fast X-ray pulsar to be eclipsed by a companion star has been discovered by astronomers using NASA's Rossi X-ray Timing Explorer (RXTE). Future studies of this unique stellar system will shed light on some of the most compressed matter in the universe and test a key prediction of Einstein's relativity theory. The pulsar is a rapidly spinning neutron star — the remaining collapsed core of a massive star that once exploded as a supernova. Neutron stars pack more than the sun's mass into a ball that is only about 12 miles across. "It's difficult to establish precise masses for neutron stars, especially toward the higher end of the mass range theory predicts," said Craig Markwardt at NASA's Goddard Space Flight Center in Greenbelt. "As a result, we don't know their internal structure or sizes as well as we'd like. This system takes us a step closer to narrowing that down." 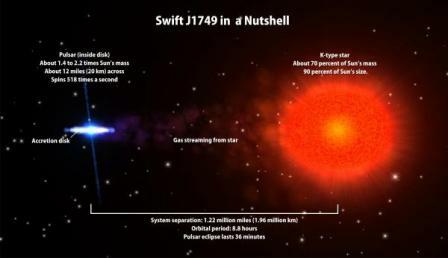 Known as Swift J1749.4-2807 — J1749 for short — the system erupted with an X-ray outburst on April 10. During the event, RXTE observed three eclipses, detected X-ray pulses that identified the neutron star as a pulsar, and even recorded pulse variations that indicated the neutron star's orbital motion. J1749 was discovered in June 2006, when a smaller eruption brought it to the attention of NASA's Swift satellite. Observations by Swift, RXTE and other spacecraft revealed that the source was a binary system located 22,000 light-years away in the constellation Sagittarius and that the neutron star was actively capturing, or accreting, gas from its stellar partner. This gas gathers into a disk around the neutron star. "Like many accreting binary systems, J1749 undergoes outbursts when instabilities in the accretion disk allow some of the gas to crash onto the neutron star," said Tod Strohmayer, RXTE's project scientist at Goddard. The pulsar's powerful magnetic field directs in-falling gas onto places near the star's magnetic poles. This means that the energy release occurs in hot spots that rotate with the neutron star, producing fast X-ray pulses. How fast? J1749 is spinning 518 times a second — a city-sized sphere rotating as fast as the blades of a kitchen blender. In addition, the pulsar's orbital motion imparts small but regular changes in the frequency of the X-ray pulses. These changes indicate that the stars revolve around each other every 8.8 hours. During the week-long outburst, RXTE observed three periods when J1749's X-ray emission briefly disappeared. Each eclipse, which lasts 36 minutes, occurs whenever the neutron star passes behind the normal star in the system. "This is the first time we've detected X-ray eclipses from a fast pulsar that is also accreting gas," Markwardt said. "Using this information, we now know the size and mass of the companion star with unprecedented accuracy." By comparing RXTE observations across the theoretical mass range for neutron stars, the astronomers determined that J1749's normal star weighs in with about 70 percent of the sun's mass — but the eclipses indicate that the star is 20 percent larger than it should be for its mass and apparent age. "We believe that the star's surface is 'puffed up' by radiation from the pulsar, which is only about a million miles away from it," Markwardt explained. "This additional heating probably also makes the star's surface especially disturbed and stormy." Writing about their findings in the July 10 issue of The Astrophysical Journal Letters, Markwardt and Strohmayer note that they have all but one orbital variable needed to nail down the mass of the pulsar, which is estimated to be between about 1.4 and 2.2 times the sun's mass. "We need to detect the normal star in the system with optical or infrared telescopes," Strohmayer said. "Then we can measure its motion and extract the same information about the pulsar that the pulsar's motion told us about the star." However, a pioneering X-ray measurement well within the capability of RXTE may make a hunt for the star irrelevant. One consequence of relativity is that a signal — such as a radio wave or an X-ray pulse — experiences a slight timing delay when it passes very close to a massive object. First proposed by Irwin Shapiro at the Massachusetts Institute of Technology (MIT), in 1964 as a new test for predictions of Einstein's relativity, the delay has been demonstrated repeatedly using radio signals bounced off of Mercury and Venus and experiments involving spacecraft communications. "High-precision measurements of the X-ray pulses just before and after an eclipse would give us a detailed picture of the entire system," Strohmayer said. For J1749, the predicted Shapiro delay is 21 microseconds, or 10,000 times faster than the blink of an eye. But RXTE's superior timing resolution allows it to record changes 7 times faster. With only three eclipses observed during the 2010 outburst, RXTE didn't capture enough data to reveal a large delay. However, the measurements set a limit on how massive the normal star can be. The study shows that if the star's mass was greater than 2.2 times the sun's, RXTE would have seen the delay. "We believe this is the first time anyone has set realistic limits for this effect at X-ray wavelengths outside of our solar system," Markwardt noted. "The next time J1749 has an outburst, RXTE absolutely could measure its Shapiro delay." Launched in late 1995, RXTE is second only to Hubble as the longest serving of NASA's currently operating astrophysics missions. RXTE discovered the first accreting millisecond pulsar — SAX J1808.4-3658 — in 1998 and continues to provide a unique observing window into the extreme environments of neutron stars and black holes.